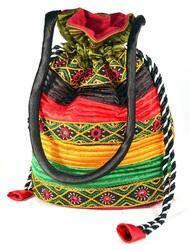 Reshmi All Over Batwa multicolor Reshmi Batwa All Over Big Bag. Ahir Work, made up of Satin Silk contain handel to carry.Single pocket used from tradionally by Indian womens. Pure silk pouches , Multi purpose pouches to carry cosmetics, essentials or even your mini tablet. Material: Pure Silk, Care: Dry clean only, Size: 10" x 7".